Founding members of the Staten Island Chamber Music Players in 1972, The Chamber Players Brass Quintet has since performed throughout the five boroughs in such diverse locations as The Rainbow Room and the Channel Gardens at Rockefeller Center, Lincoln Center's "Alice Tully Hall, the JP Morgan Auditorium on Wall Street, the Enrico Fermi Center of the Bronx, in Queens' Jacob Riis Park, Brooklyn's Bay Ridge Music Festival, at New York Plaza, Chase Manhattan Plaza, John Jay Park in the "Silk Stocking" district, Manhattan, and for "First Night" at Snug Harbor Cultural Center. Individual members of the Quintet have received degrees from University of Houston, The Manhattan School of Music, Melbourne University (Australia), and the Julliard School of Music. 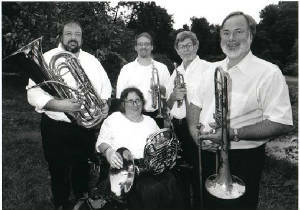 The Quintet's performing affiliations include Master Virtuosi of New York, teh American and New York City Ballet Orchestras, The New York Lyric Opera, The Marlboro Festival Orchestra, The American Symphony, The Singapore Orchestra, The US Navy Band, The Symphony of the New World, The Band of America, The Roanoke Symphony (VA), Houston Grand Opera, Village Light Opera and The Bronx Symphony. As music educators, the performers have taught at Wagner College, the Music Institute of the SI Jewish Community Center, the United Nations International School, The College of Staten Island, The Calhoun School, Brooklyn College, Treeman State University (MO), and in their own private music studios.